Bubby and Bean ::: Living Creatively: GIVEAWAY // Win a $50 Gift Card to Pedestrian Designs Handmade Hats + Accessories! 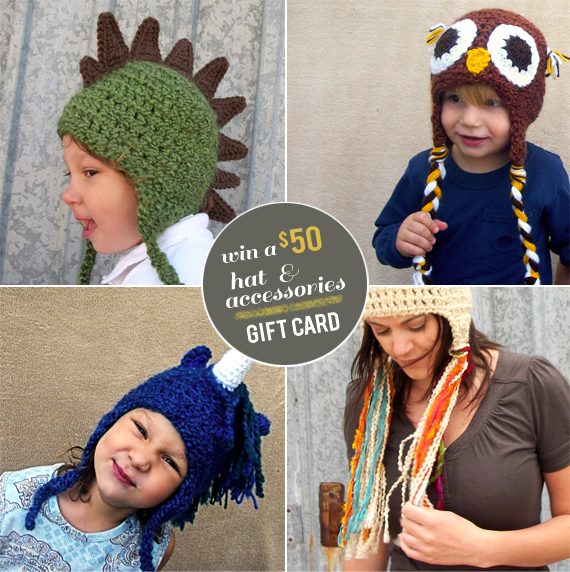 GIVEAWAY // Win a $50 Gift Card to Pedestrian Designs Handmade Hats + Accessories! We have such a fun featured sponsor giveaway this month you guys! You may have read my interview with Christine of Pedestrian Designs last week - she makes absolutely adorable dragon, unicorn, wise owl and fairytale-inspired hats along with some really gorgeous cowls and accessories. Her designs are so playful and vibrant and would make really cool holiday gifts for the little ones (and adults too!). And today, she's giving readers a chance to win a $50 gift certificate to spend her shop! This giveaway is open to all Bubby and Bean followers/subscribers. (If you're a new reader, just make sure to subscribe first using GFC or one of these readers). Then just leave a comment with your favorite item in the Pedestrian Designs Shop! This giveaway is open through December 3rd. The winner's name will be randomly chosen and announced shortly after. 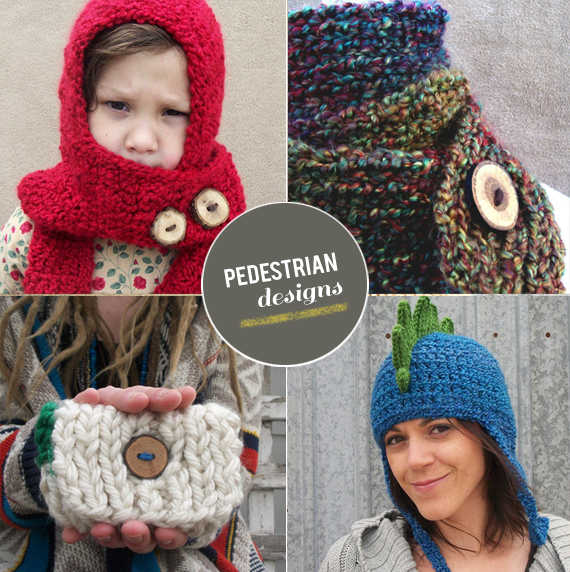 Thank you again to our featured sponsor Pedestrian Designs for giving Bubby and Bean's readers the chance to win some of her adorable hats and accessories! Christine has also generously offered up the following coupon for Bubby and Bean readers: Take 15% off your entire order at Pedestrian Designs with code BUBBYANDBEAN15. Good Luck! I love the dragon hat! Would be so cute on my niece! I am a follower of your lovely blog via HelloCotton. And my favorite item is the Little Red Riding Hood - Hat, Scarf, Scood. I hope they can make it in an adult size! I adore the The Rapunzel Hood in Latte - Cream Hood, Ecru Hood with Long Tassels! I hearted the shop on Etsy too! :) thank you! What a cool shop! I know a little girl that would die over the Unicorn hat! I love the owl hat in nutmeg! I love the Rapunzel Hat in Latte!! I <3 the Nomad Pouch and the Chunky Woodsman Cowl in Wood, Latte, and Olive, and Nutmeg-so hard to choose my favorite color!! Favorited Pedestrian Designs on Etsy!! Following Pedestrian Designs on Pinterest!! I'm a GFC & bloglovin follower! I favorited pedestrian on Etsy. My username is justByou. New fan of pedestrian on fb! Username is Justbyou Kim. Following Christine on Pinterest! Pinterest username is justByou. Already a twitter follower with username @shopjustByou. Love it! Thanks for hosting this give-away! We have a unicorn lover in the house and she'd love the unicorn hat! My favorite would be the Teenage Mutant Ninja Turtle hat, definitely! I am a new follower and I love the rapunzel and owl hats! Pedestrian is officially a favorite on Etsy! I have liked Pedestrian on Facebook for some time! I now follow Pedestrian Designs on Pinterest! I a.k.a Bridgehunter tweeted about the Giveaway! I @Bridgehunter now follow you on Twitter! I really like the The Robin Hood in Olive - Adult sized Hood, Folklore, Woodland Hat. I like Pedestrian Designs on facebook! Katy A.
I am now following her on pinterest! katy010305 Katy A.
I also really love the unicorn hat for kids!! That's just so freaking cute. I loved The Nomad Pouch. I follow your cute little bloggy blog. My fave item on the shop's page is the big ole bunny hat!!!! My girl would look amazingly cute in it!!! Love the Owl Hat in Grape - Woodland Animal Hat, Costume Owl Hat for Children, Girl Owl Hat! Following via gfc I like the autumn cowl with the button! I Like Pedestrian Designs on Facebook! Following Pedestrian Designs on Pinterest! I love the Robin Hood in olive. I heart PD on Etsy (houseofplush). I like PD on FB (Suzanne Gregg). I follow PD on Pinterest. I like the The Briar Rose Beanie in White - Flower Hat, Rose Beanie, Girl's Sleeping Beauty Hat the best! I also like the owl hats.